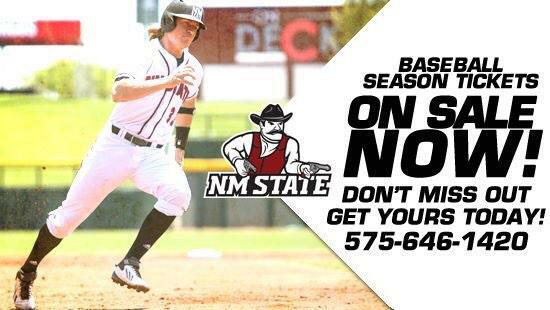 LAS CRUCES, N.M. – The New Mexico State athletics department has announced that season tickets for the 2015 Aggie baseball season go on sale starting Wednesday, Jan. 21. There is plenty of excitement going on around the baseball program with the hiring of new head coach Brian Green, a newly renovated stadium, which includes an enormous shade cover, and 22 home games on the schedule. Season tickets for reserved seating, which is located in the middle section of the stadium, are $100. That equates to just over $4.50 per game. General admission season tickets are priced at $75. That means fans will pay only $3.40 per game. Fans can purchase season tickets by calling the Pan American Center Ticket Office at 575-646-1420. The Aggies went 13-14 at home last season and look to improve the home record this season under Green, who is known for his offensive teachings and knowledge. He became the 10th head coach in NM State baseball program history on Friday, July 25, 2014. Green, a graduate of the 1995 class at New Mexico State, comes back to his alma mater after coaching for six seasons as an assistant at Kentucky. In 2014, he directed the best offense in college baseball and in Kentucky history. Green was UK’s offensive coordinator and infield defensive coach. The Aggies hit .278 as a team last year and bring back the top two offensive players from last season’s roster. Junior infielder Derek Umphres hit .328 last season and senior Michael Paulson posted a .317 batting average. The Annual Alumni Game is scheduled for Jan. 31 and is a free event, while the first home game of the year is set for Friday, March 13 at 6 p.m. versus Bakersfield. Fri, Feb. 27 vs. Incarnate Word - 6:00 p.m. Sat, Feb. 28 vs. Incarnate Word - 1:00 p.m.
Sun, March 1 vs. Incarnate Word - 1:00 p.m.
Fri, March 6 vs. Northern Kentucky - 6:00 p.m. Sat, March 7 vs. Northern Kentucky - 1:00 p.m. Sat, March 7 vs. Northern Kentucky - 5:00 p.m.
Fri, March 13 vs. Bakersfield * - 6:00 p.m. Sat, March 14 vs. Bakersfield * - 1:00 p.m.
Sun, March 15 vs. Bakersfield * - 12:00 p.m.
Thu, April 2 vs. Northern Colorado * - 6:00 p.m.
Fri, April 3 vs. Northern Colorado * - 6:00 p.m. Sat, April 4 vs. Northern Colorado * - 12:00 p.m.
Fri, April 17 vs. Grand Canyon * - 6:00 p.m. Sat, April 18 vs. Grand Canyon * - 6:00 p.m.
Sun, April 19 vs. Grand Canyon * - 12:00 p.m.
Tue, May 5 vs. New Mexico - 6:00 p.m.
Fri, May 8 vs. Texas-Pan American * - 6:00 p.m. Sat, May 9 vs. Texas-Pan American * - 6:00 p.m.
Sun, May 10 vs. Texas-Pan American * - 12:00 p.m.
Thu, May 14 vs. North Dakota * - 6:00 p.m.
Fri, May 15 vs. North Dakota * - 6:00 p.m. Sat, May 16 vs. North Dakota * - 12:00 p.m.